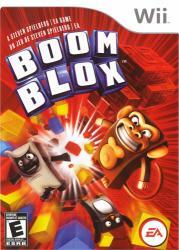 Fun for kids and the entire family, BOOM BLOX offers action-packed interactive activities that takes Wii play to a new level of creativity and fun with single player, co-op, and versus gameplay. Explore the visceral gameplay�perfectly suited for the Wii�s interactivity�that keeps you destroying your way through brain-twisting challenges. Interact with entertaining characters such as the Blox-laying chickens or the baseball throwing monkeys, who bring personality to the Tiki, Medieval, Frontier, and Haunted themed environments. Additionally, remix any level of the game in Create Mode using props, blocks, or characters that have been unlocked during the game. You can virtually build anything you can dream up.